The Iran regime, as the main state-sponsored terrorism received a blow on Tuesday, October 16, 2018, when the German authorities extradited the Iranian regime’s diplomat-terrorist, Assadollah Assadi to Belgium. Two of the accomplices of the terrorist plot to attack the Iranian resistance supporters’ rally in France were earlier arrested in Belgium and another person was detained in France and transferred to Belgium for prosecution. All the events leave no room for doubt about the Iran regime’s rule in leading the state-sponsored terrorism. The Belgian authorities, in turn, have accused all four people with plotting a terrorist attack. “All four are now under arrest. They have been charged with attempting murder of a terrorist nature and plotting a terrorist act,” the prosecutor said. Seemingly, the Iran regime is caught up in a real plight. But the question that comes to mind is whether the regime is imprudent of the consequences of taking such a high risk of committing a terrorist act in the European soil, at a time when the mullahs are in a great need of Europe to salvage their dire economy after the United States’ economic sanctions are resumed, or not. To answer this question, one should consider the changes in the theocratic regime’s status quo in Iran, both in domestic and international aspects. For the last nine months, the popular protests have been continuing in Iran and the mullahs have not been able to keep a tight rein on the anger of the oppressed people whose demands have promoted to regime change. At the same time, significant changes on international levels, such as countries distancing themselves from the appeasement policy towards the regime, and the robust sanctions implied on it by the US after its withdrawal from the nuclear accord, have enmeshed the regime in a high corner. Due to the mullahs’ warmongering policy and its spending of the national wealth in Syria, Yemen and other subject countries of its covert invasion, as well as its corruption and mismanagement, the national currency has lost 80 percent of its value in 12 months. Incapable of tackling the crisis, the regime’s highest officials have confessed that the PMOI has had an increasing role in organizing and leading the popular protests. As the only practical, tested method, the mullahs, as the main source of being the godfather of the state spencered terrorism in the world, have resorted to terrorism. On one hand, the mullahs seek to intimidate the international community, and on the other hand, they intend to crush the People Mojahedin Organization of Iran (PMOI/MEK), as the main threat to their power. To achieve their goals, the mullahs attempted to carry out major terrorist plots against the Iranian opponents, particularly the MEK and the National Council of Resistance of Iran (NCRI) over the past few months. In March, the mullahs intended to launch a mass killing in the gathering of the PMOI members celebrating Nowruz (the Iranian New Year) in Albania. 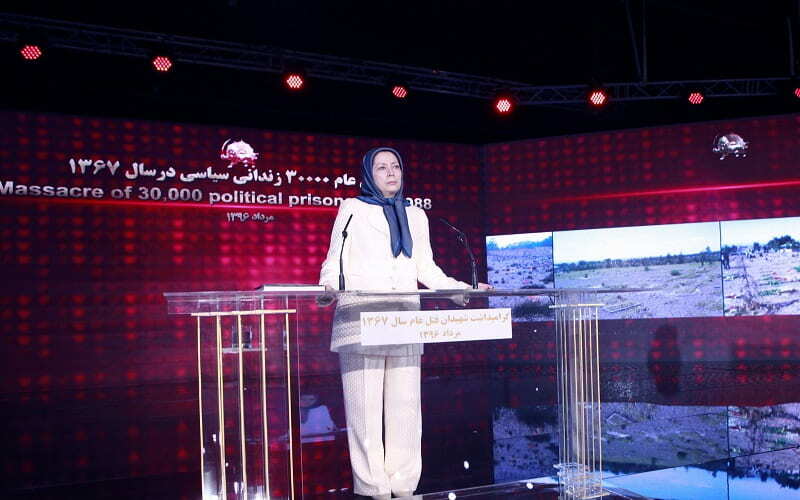 To deliver a major blow to their main opposition, the NCRI and the MEK, The regime planned a major operation to bomb the Free Iran Gathering in Villepinte, on June 30, 2018. The terrorist plot was so important to the Iran regime that the mullahs took the risk of deploying the third chancellor in their embassy in Vienna, Asadollah Assadi, as the field commander of this operation. In August, the regime’s spies were arrested in the U.S., while staging surveillance activities and preparing for the assassination of the NCRI members. The regime, being so desperate in need of a show of force even barraged the headquarters of the Iranian Kurdish parties in Iraq with rockets in September which left dozens of casualties. It is for the first time that an Iranian regimes diplomat-terrorist is taken to a European court, with the consequences of officially exposing the role of the Iran regime in state-sponsored terrorism. This unprecedented firm response is a significant sign of change in appeasement policy towards the regime. Three French ministers issued a joint statement vowing to confront terrorism on their soil and to dry up the financial resources of terrorism. Hereto, the accounts of two Iran regime’s officials were frozen. Before that, the French government had asked its political cadre not to travel to Iran and also had halted the nomination of a new ambassador to Iran. In reality, the state-sponsored terrorism is a key instrument of advancement in the Iran regime’s foreign policy, so it is expected that the regime’s diplomats be systematically involved in terrorism and espionage. The Iranian resistance has always demanded the international community to take a firm policy to keep a tight rein on the brutal state-sponsored terrorism of the Iran regime by making public the dossiers of its terrorist activities and by closing down the regime’s embassies and its other centers of espionage and state-sponsored terrorism.